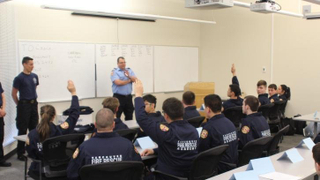 The academy is a once-in-a-lifetime opportunity for local students to experience what it takes to become firefighter. Follow along! This morning, students grades 10 to 12 from Vancouver schools braved the weather to begin the week-long annual VFRS Youth Academy. Students were fitted with full firefighter turnout gear, and introduced to the fire trucks and their on-board equipment. They were shown the essentials of hose-handling, fire-streams, and connecting 5-inch supply lines. Most importantly, they learned that teamwork is going to be critical for their success on these fire training grounds.